Add user account of branch office technician to RTCUniversalSBATechnicians group. Add SBA to branch office site using wizard in topology builder and publish topology. Optional: Allow RTCUniversalSBATechnicians group to use WebServer template in Enterprise CA. Joining SBA machine to domain (and automatically adding RTCUniversalSBATechnicians group to local administrators). “Find Central Management Store” – This is not mandatory but it helps to ensure that CMS can be accessed, which is necessary for downloading the configuration. Download and install configuration to SBA – these steps avoid the necessity to wait for replication. Requesting and installing a certificate, which is needed for (M)TLS. The easiest way is using online access to an Enterprise Certificate Authority. If that is not supported, the certificate signing request can be created and submitted to any certificate authority. The certificate must be assigned to Lync services. Finally all services are started – this completes SBA deployment; the only step left is the configuration of the integrated media gateway. During normal operation the web UI also provides diagnostic functions to show event log entries and to display PSTN interface status, state of replication and other useful information. Details on this and a complete walkthrough is shown in this video (100MB, 7 minutes). 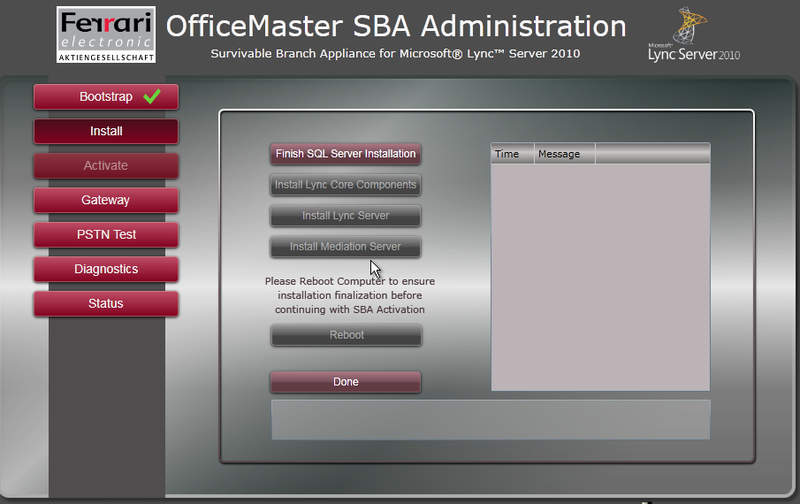 This entry was posted in Lync and tagged Lync, Survivable Branch Appliance (SBA). Bookmark the permalink.